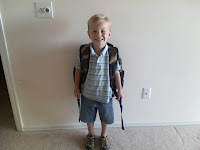 The Followell Family: Caden's in Kindergarten! I can't believe I have a kid old enough to go to Kindergarten. I was just about as excited as Caden was for his first day of school. I was a little sad, but more excited for the wonderful experiences he is going to have and all that he is going to learn. Last week we went to the store and let him pick out his own backpack and lunch box. Guess what he picked? Camouflage! That is just sooooo Caden. 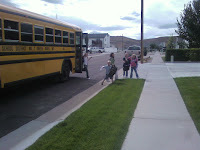 He gets to ride the bus to and from school. I was a little nervous for that. I hoped he would know what to do when he reached the school, but the teachers are all right there to give direction. When I was growing up we always had hot lunch and I hated it. I was jealous of the kids who brought cold lunch. I figured that was what Caden would want, too. After his second day of school he told me,"I want to eat the lunch at the school". I guess the grass is always greener. We made a compromise and decided he could pick out two hot lunches a week. Also, Kindergarten here is all day long. Caden usually can take a good two hour nap every afternoon, but he seems to be getting along just fine without it. I thought it was neat to see that his school was the Jackson Jaguars, because my elementary school was the Jessop Jaguars. Ah memories! The girl posing with Caden in the last picture is our next door neighbor, Crystal. 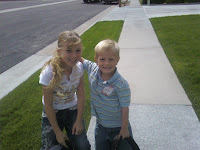 She is so nice to Caden and offered to pick him and take him to the bus stop every day. She even sits with him on the bus. She really is a sweet girl. Caden is such a sweet boy and makes friends wherever he goes. I am so excited for him to be in school and it's fun to see him feel so grown up. Congrats Caden on your first day! I'm so happy for Caden...looks like you got your camera back! Now I can look forward to lots of posts! Also...add some more music to your player...I'm bored with Tim McGraw!! Lindsey, you finally got a blog and didn't even tell me! Que el effe? Caden is so cute! Anyways, you can check out my blog too, it's ntgsoutham.blogspot.com! Hope all is well! I found your blog on Deirdra's, hope it's okay that I checked it out. Caden looks so grown up. Time flies!! Check us out at the4neffites.blogspot.com, if you want to. I came across your blog, I sure hope you don't mind me looking at it. I want you to know your family picture is BEAUTIFUL!! I love it! Beautiful Family! Glad I came across your site. You look like you are doing wonderful!